When the Second World War broke out in the fall of 1939, most armies had issued anti-tank guns to stop enemy armor. The 37mm bore became standard for most armies, with Britain picking a 40mm size for its 2-pounder gun. This could penetrate the armor of most tanks of the day, but it could not dent the armored turrets of fixed fortifications. Facing the prospect of an assault on modern Czech fortifications with tough bunkers and armored gun positions, in the spring of 1938 the German Army asked for a mobile version of Rheinmetall's powerful 88mm anti-aircraft gun. The first prototype submitted was simply a flak gun with a more mobile wheeled chassis and splinter shield, towed by a prime mover. The Army Weapons Office disliked this as it exposed the crew to enemy fire while the gun was placed in firing position, and asked for a weapon mounted directly on its prime mover. The result had the ungainly title of "8.8 cm Flak 18 (SFL) auf Zukraftwagen 12t (Sd.Kfz 8)," more commonly known as Bunkerflak or Bufla for short. The 88mm gun was mounted on a lightly-armored halftrack, with a splinter shield to protect the gun crew. The prototype went to the Kummersdorf proving ground, where its new armor-piercing rounds greatly exceeded expectations. The range masters even set up a firing test against a tank (they type is unrecorded); it easily destroyed tanks at long range but a Luftwaffe observer sniffed that the guns were unlikely to ever be used against enemy armor and "are much more likely to engage aircraft." At the time, German intelligence believed the thickest armor carried by a potential enemy tank was the 40mm of a Renault R35; the much thicker protection of the Char B1 or British Matilda II would come as a great shock in 1940 (as would that of the T-34 a year later, a damning indictment of German "efficiency"). The Bufla would fight enemy fortifications, and 10 of them were delivered after Daimler-Benz heavily modified the chassis to absorb the massive shock of the weapon's recoil. Czechoslovakia fell without a shot being fired, and the Bufla went to war in September 1939 with the 1st Company of the 8th Heavy Tank Destroyer Detachment. "The mobility of our machines allows real tactical flexibility," reported the company commander, Capt. Frenzel. "We can change position after two or three shots. Among other things, this allowed us to avoid losses in Poland, as enemy artillery had no time to adjust their fire against us." Reorganized in February 1940, the company kept six machines and put four worn vehicles into reserve — despite the modifications, it appears that repeated firing did indeed damage the machines. During the 1940 campaign the company was attached to the 1st Panzer Division, seeing action against French bunkers at Sedan. Across the Meuse, a pair of Bufla were ready when the French 3rd DCR's FCM 36 tanks spearheaded a counter-attack. The big guns devastated the attacking tanks, and the survivors reported that they had met the fire of 100mm guns. Charles DeGaulle's 4th DCR met the big guns again at Montcornet and at Chambry, where even the seemingly invulnerable Char B1 bis exploded at the first shot and the houses of Chambry provided no cover for the French armored infantry, the Chasseuers Portees. Two Bufla were lost in these battles, replaced by vehicles from the reserve. After the French campaign, the company was attached to XXXIX Panzer Corps for the attack on the Soviet Union. The Bufla could knock out any Soviet tank, even the awesome T-34 and KV-1, and found itself in high demand. Two more were lost by the end of the year, but the reserve vehicles must not have been operational because the company received towe 50mm guns as replacements and was re-designated as the independent 601st Tank Destroyer Company. By late summer only two of the big vehicles were still operational, and the company was absorbed by the 559th Tank Destroyer Battalion. The last Bufla was knocked out in March 1943. 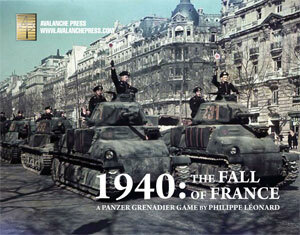 The Bufla appears in several scenarios of 1940: The Fall of France, and is a devastating weapons against event he toughest French tanks. Though there were only a few of these guns in action, the Germans employed them skillfully and managed to have them present several times when the French struck what should have been an exposed and vulnerable flank.